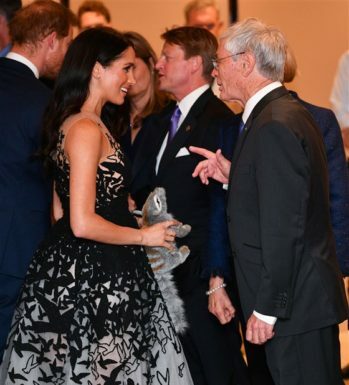 This look of Meghan Markle’s ties for the BEST outfit of the royal tour in my book… or maybe ever! It’s a close call between this Oscar de la Renta seagull-embroidered dress and the Fijian blue SAFiYAA gown she wore at the state dinner in Fiji. 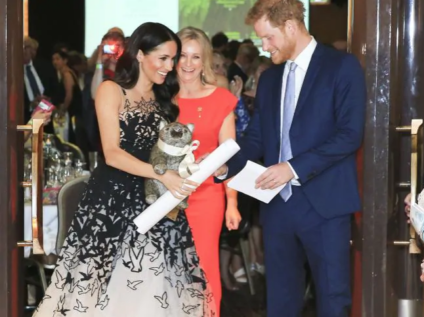 The Duchess of Sussex wore this incredible getup to the Geographical Society Awards Gala in Sydney. After Prince Harry and Meghan’s whirlwind trip to Fiji and Tonga, the royal couple made a brief stopover back to Sydney before jetting off to the last leg of their tour (New Zealand)! 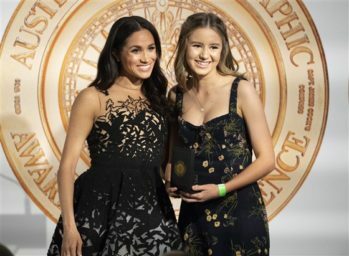 Prince Harry spoke at the event and presented an award, and Meghan presented the Young Conservationist of the Year Award to Sophia Skarparis, who campaigned to ban all plastic bags in New South Wales. 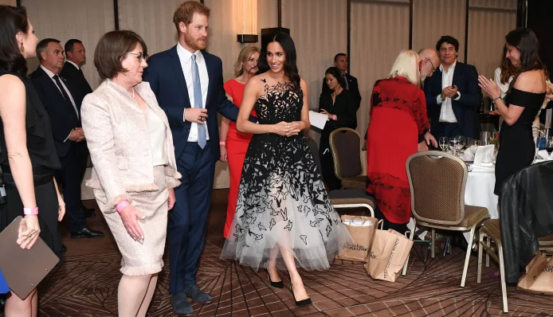 The unforgettable fairytale gown Meghan wore is from Oscar de la Renta’s Pre-Fall 2018 collection and unfortunately unavailable. Not that I’d be able to afford it anyway!!! I did find quite a few lookalikes to her dress below, although not many are what you’d call budget-friendly. I found only a couple worthy of posting under $200, but the rest are in the $300-$600 range! Meghan’s Oscar de la Renta seagull gown is so unique, however I did find some great black cocktail dresses with a similar illusion neckline! The best I could find for under $200 is this number on sale. If you don’t mind spending a bit more, don’t miss this, this, this and this. All under $600 and great investments for cocktail parties, weddings, and other fancy events! Her exact shoes are back in stock here, but to get her shoe look for less, don’t miss this pair and this pair!